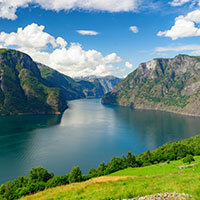 It’s the land of magnificent fjords, remarkable history, the Northern Lights, Vikings and rigid national character. Be a part of Fantasy’s brand new 29-day Scandinavia tour, traveling by motorhome and truly experiencing Germany, Denmark, Norway, Sweden and Finland – unique countries in this amazing part of the world. It’s even more amazing than you might think. Arriving in Hamburg, Germany, our adventure begins. After a delicious German welcome dinner, we rest up that evening in our hotel. The following morning we pick up our 20 foot Class C motorhomes and then head for…where else? The local German supermarket. It’s a short drive to our first campground experience in Schleswig – which traces back to 804 A.D. when it was a powerful Viking settlement. We leave Germany the following day and drive to Billund, Denmark, crossing the Jutland Peninsula to visit the most iconic modern Danish amusement park – LEGOLAND. With 60 million LEGO pieces incorporated into the park’s many attractions, we can let our imaginations run wild. Here we have our Welcome to Denmark dinner. The following day we continue our drive through the scenic farmlands of the Jutland Peninsula stopping along the way to step back in time to the 1500s when we visit the medieval Spoettrup Castle. It’s Day 6 and that means Norway, heading to the spectacular fjord region and camping that night on Grinda Fjord. Traveling through the beautiful countryside the following day we (and our rigs) board ferries to island hop to Bergen, Norway’s second largest city and the gateway to the famous Norwegian fjords. We immerse ourselves in the local culture that evening with Norwegian folk music and dancing. The following morning, we have a guided tour and lunch in Bergen. Afternoon activities are up to us – shopping, sightseeing and exploring this ancient city. We’re up early the next morning for a different view of this vibrant area which lies between the “Seven Mountains.” We’ve got more free time in Bergen before our short drive to Voss. All aboard! We begin the next day with a scenic railway journey, traveling over one of the steepest narrow-gauge railway lines in the world offering panoramic views of magnificent mountain scenery. 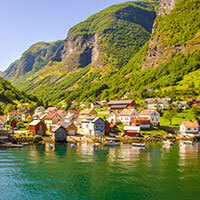 We disembark for lunch in Flam – a tiny village surrounded by steep mountainsides, cascading waterfalls and narrow valleys. The tour continues on to Gol – another short drive, but one of the most spectacular in all of Europe. The following day we move on to Norway’s pulsating capital city, Oslo. We’ve got two full days there – beginning with a guided motorcoach tour of the Viking Ship Museum, Kon-Tiki and the Vigeland Sculpture Garden. Fantasy leaves us a full free extra day here, and it’s a good thing because there’s much to see and do. Oslo is one of Europe’s fastest growing cities, and buzzes with energy with cutting edge food, new neighborhoods and iconic attractions. We depart Oslo for Sweden, but stop en-route for lunch and time to explore Fredrikstad, a well-preserved fortified town built in 1567 and constructed with wide water-filled moats. The drive continues through the Lake District to Stockholm, Sweden’s capital and the most populated city in Scandinavia. It encompasses 14 islands on the Baltic Sea, joined by 50 bridges. One of the most liberal and progressive cities in the world, Stockholm also hosts a rich history. After setting up camp, we enjoy a guided city tour. The next afternoon, we leave our rigs behind and board a cruise ship for an overnight voyage to Helsinki, Finland. On board, we dine at a traditional Swedish Smorgasbord before retiring to our first class cabins. After docking in Helsinki the next morning, we take a guided tour of this lively seaside city of beautiful islands and green parks, visiting open-air markets located amidst Russian-influenced architecture. We’ve got the afternoon to explore further on our own before boarding our ship to return to Stockholm, arriving the next morning. We return to our campground and the next morning begin our drive down Sweden’s scenic east coast to Kalmar and then on to Vaxjo. As we continue our drive south, we enter the area known as the “Kingdom of Crystal” home to world famous Swedish glass making since 1742. We visit three famous glass works factories – Orrefors, Kosta and Malaras Glass Works for a glass blowing demonstration (and a littlek shopping)! From Vaxjo, we board a ferry for a short ride to Denmark. 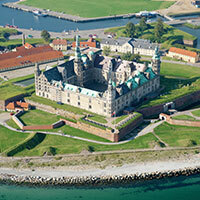 We stop for a guided tour of the imposing Kronberg Castle, the setting for Shakespeare’s Hamlet, and then drive on to Copenhagen, Denmark’s capital. We’ve got three nights in Copenhagen, and we kick it off with a guided tour of Scandinavia’s largest city and home to Hans Christian Andersen’s Little Mermaid. We enjoy a traditional Danish lunch and spend the afternoon at the enchanting Tivoli Gardens, which opened in 1843 and is the second-oldest operating amusement park in the world. 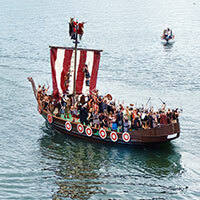 Fantasy gives another free day in Copenhagen, recently selected by Lonely Planet travelers as the # 1 city to visit. Food markets, innovative design, shopping galore clean waters and green parks all combine to make it an incredible experience. We depart Copenhagen for a short drive to Odense, crossing the nine-mile bridge linking Zealand to the island of Funen. Along the way, we stop in Roskilde to visit the Viking Ship Museum and actually set sail on the Roskilde Fjord in a traditional Viking ship. Afterwards, we enjoy lunch and then visit the imposing 12th century Roskilde Cathedral. In Odense, we take a guided walking tour to visit the home of Hans Christian Anderson. That afternoon, we drive a brief 50 miles through the enchanting Danish countryside to Fynshavn, stopping to visit the moated Renaissance castle Egeskov Slot, built on an island in 1554 and featuring the Veteran’s Car Museum, with 350+ vintage cars on display and the world’s largest maze. It’s our last day, and we return our motorhomes to Hamburg, spending the night in a hotel and enjoying Fantasy’s traditional Farewell Dinner. The next morning, we travel home – all the richer for the experiences we’ve had in this amazing part of the world. Fantasy’s inaugural Scandinavia Tour takes place August 26 to September 23, 2020 and is already filling quickly. Don’t miss out on this unique opportunity.